By now there must be welts on John Delaney‘s fingers. All last week the email spam-filter kicked in, such was the suspicious drip, drip, drip of good and exciting news the FAI were desperate to project. They call it the Festival of Football and it was a stroke of genius on his part when he started moving the AGM around the country, for it allowed for this sort of tireless and perfect politicking in the run-in. Lakewood Athletic awarded €170,000. St Mary’s plaque for the 70th anniversary. The opening of an academy at Fermoy FC. Cobh Wanderers and their gym addition. Castleview’s development plans. A services to football award at Springfield Ramblers. That’s not to say all of the above are not hugely worthy and important additions to the soccer arsenal in Ireland, but you’d be wrong to think there wasn’t some serious value away from that. 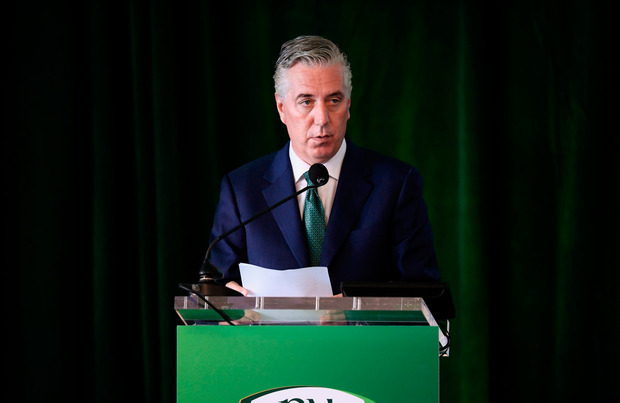 It’s why one FAI employee points out how correspondence about pitch openings and community visits are given priority, as per Delaney’s orders. And look at a microcosm of the effect. Recently, talking to a friend who works tirelessly within a soccer club in Laois but questions almost all in life, he was quick to jump to the defence of the chief. 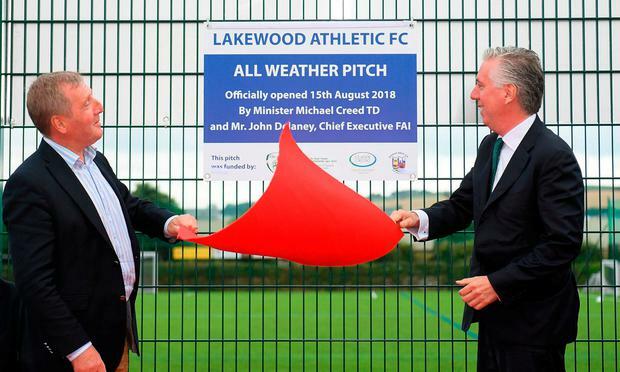 His first reason was his recalling of Delaney showing up at their patch and cutting the ribbon on a new all-weather surface. Of course the bigger insight into the benefit is he knows his audience to the point he’s immovable. And this is one of the mistakes we make when analysing and understanding Delaney at this time of year. The editors want to you to zoom in on the AGM and the lawyers want you to zoom out onto the wider FAI. But to do that would be like delving into the pre-election manifesto of the Workers’ Party of Korea, as if the literature matters and as if there’s more people that actually matter. Yet, annually there’s this focus on what comes at the end of the FAI’s festival of football. We get all hot and bothered on the way into the meeting by the questions that need asking. And, after media are literally penned away, and the floor sits and doesn’t ask the pertinent questions about accountability in the name of betterment because why bother, we come out even hotter and more bothered by the feeling nothing has taken place. But for Delaney that is the wind-down and the sign off. Indeed with such a political character, he must find it amusing how we lose sight of objectivity through emotion and focus on the debt promises and 10-year tickets and honorary presidencies, after he’s spent his trip solidifying power and growing his base. Not everyone is an international fan or from the League of Ireland, and what those groups as well as many media who dislike him fail to realise is that many do actually like him. Still, if you know the enemy and know yourself, you need not fear the result of a hundred battles. If you know yourself but not the enemy, for every victory gained you will also suffer a defeat. Thus, as much as we talk about what we perceive to be his weaknesses, we fail to recognise Delaney’s strengths as if it goes against every nerve and sinew of our being. All of fourteen years ago when he took over though, as an example, this was an unwieldy organisation, and he has managed to bring serious structure to what was genuine chaos. The key element here though is what that structure is for and who it benefits most. One of those would appear to be Delaney himself. There have been many foolish acts along the way, but don’t think that he is a fool. Instead take two stories as demonstrations of the evolution of what is his association. Back when Fran Rooney got the top job, he asked the old committee men to write down what their actual role was, and he didn’t last long. Delaney learned from that, and by the time former council member Paul Cooke tried to challenge by asking a question at an AGM, Delaney was so comfortable in his power he reprimanded him. Better than any left in our sport since the demise of Pat Hickey, he brings up the traits that today personify a very good politician when those same traits were meant to highlight what a very bad politician represented. That’s because Delaney is an expert in the sphere of power being for consolidation. It’s crucial to understand this as you have to first realise what the goal of someone is in an office before going after them for perceived faults. The likes of Wada are a perfect example in this area as many are quick to point out that they aren’t doing their job, while mistakenly thinking their job is about what it says on the tin. Are these extremely well-paid folk who got that far by excelling in other careers really inept idiots? Or are they actually continuing to be successful at what matters? Out of sport it’s the same story, as do you think Leo Varadkar or any other politician has your best interest as their foremost concern or their own? They may align sometimes, or even often, as keeping you pleased keeps them in their positions, but it’s the latter that matters most. Delaney always got this and it in no way makes him a bad person, just appear selfish which is part of human nature. So since this is pure and ugly politics, this is the question to ask of Delaney. Is he really that poor at helping the FAI develop a reputation of being transparent and open to criticism? Or is he successful at making sure the FAI cannot be held accountable for what it does with its revenue, and how little it achieves in terms of developing structures from grassroots right through to internationals? Often that’s a query bypassed because of the urge to zone in on perceived flaws and have a cut. It never works though for look back at the talking points over the years and how, for those looking to take him down, they were like bringing a knife to a gunfight. How he accepted €5m from Fifa (he accepted a €5million payment on behalf of the FAI following the controversial Thierry Henry handball that led to Ireland failing to qualify for the 2010 World Cup) while telling all he wouldn’t bow to Blatter’s style when such payments meant he strengthened Blatter. How in a role of diplomacy he’s been shoeless at a major footballing tournament and caught singing a rebel song in a bar. How supporters like You Boys In Green tried to bring back atmosphere to Lansdowne Road but due to their peaceful protest nature had flags and banners removed against the stadium’s own regulations. How last month he forgot to tell the PFAI, who he shares a building with, they’d initially be helping out with a fund for struggling clubs. But like the AGM, none of that matters. He’s untouchable and the how behind that is to truly understand his skill. Just don’t conflate being good at what you do with doing much good.